In addition to the updated COOLPIX range yesterday, Nikon also announced the new Nikon D3300 as well as two new lenses in the Nikkor line. All products can soon be pre-ordered from Digital Camera Warehouse. The new compact and lightweight D3300 is equipped with a high resolution 24.2 megapixel DX-format CMOS sensor with the optical low-pass filter removed and the latest EXPEED 4 image processing system to deliver quality images and video. The D3300 will be a great camera for those individuals who are new to photography or upgrading from a point-and-shoot camera. Nikon is confident the instructive Guide Mode on the D3300 will help unleash the photographer in everyone. This new 35mm from Nikon is a new FX-format prime lens with a fast maximum aperture and optics designed for high-megapixel D-SLR’s. Lighter, more compact, and more affordable than its professional counterpart, Nikon believes the AF-S NIKKOR 35mm f/1.8G is set to become a fast favourite amongst keen photographers who want to work with a classic 35mm focal length. The optical construction consists of 11 elements in 8 groups, and employs one aspherical lens element and one ED glass element in order to minimise chromatic aberrations and ensure sharp, contract-rich results. Autofocus on this versatile and portable prime lens is smooth, quiet, and swift thanks to Nikon’s SWM (Silent Wave Motor) technology, and the minimum focus distance of 0.25cm. Optimised for Nikon F-format cameras, the AF-S NIKKOR 35mm f/1.8G is also a great option for Nikon DX-format photographers seeking a fast lens for capturing classic images with amazing colour and contrast. 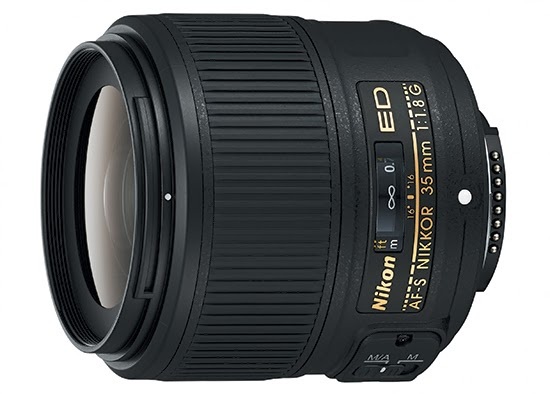 Announced alongside the Nikon D3300 D-SLR is the new ultra lightweight AF-S NIKKOR 18-55mm f/3.5-5.6G VR II lens. A great first lens, it is perfect for a variety of situations; the optical design delivers sharp, high-contrast photos and HD movies. Nikon’s Vibration Reduction (VR) system ensures clearer, images than ever before. The VR technology allows you to shoot at up to four stops faster, without the image-degrading blur that can be caused by camera shake. The multi-purpose lens renders photos and HD movies with vivid colour and superb sharpness. 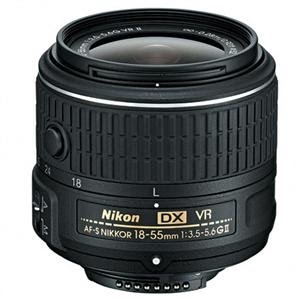 The optical design of the AF-S NIKKOR 18-55mm f/3.5-5.6G VR II lens features 11 elements in eight groups, and an aspherical lens element minimises spherical aberration and other forms of distortion while ensuring high resolution and contrast. The compact Silent Wave Motor (SVM) technology from Nikon enables quiet, fast, and accurate autofocus performance, which is a particular advantage when shooting movies. Ultra-portable and versatile the AF-S NIKKOR 18-55mm f/3.5-5.6G VR II is a true “carry-anywhere” lens.